I wasn't impressed. Writing an exceptional story is not Brown's strong point. I have no idea whether Da Vinci Code or Angels and Demons was written first - after reading them both, it's obvious it doesn't really matter as the plots are just recycled rehashes. I felt as if I had read the same book, just with a few key words changed. 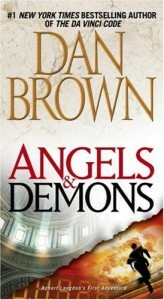 I recommend neither Da Vinci Code nor Angels and Demons for anyone looking for a really intense, gripping read; I honestly think they're nothing more than the fiction equivalent of trashy romance flicks.